Ferry View is a character Holiday Cottage located in the heart of Dartmouth, This lovely self catering holiday home enjoys magnificent uninterrupted views over the River Dart estuary to Kingswear, towards the castle and out to sea. The Cottage is in an ideal position being virtually on the level and within a very short distance of the centre or Dartmouth where there are many shops, restaurants, inns and waterfront. Just across from the Cottage are steps down to the historic Bayard’s Cove. The Holiday Cottage has been awarded Four Star Self Catering Accommodation by Visit Britain and offers all the home comforts you would expect to find. There are three bedrooms sleeping up to six people making this an excellent choice for Family Holidays. The living and dining area is open plan and very spacious. You will find a well equipped modern kitchen and breakfast table. The Holiday Cottage has a ground floor Shower/Wet Room and a bathroom with bath which is located on the first floor. Situated in the heart of the beautiful South Hams, bounded by green rolling hills, Dartmouth is a historic, charming and vibrant town. The historic town has a picturesque quayside leading to a network of Elizabethan streets, housing independent shops alongside larger national retailers. 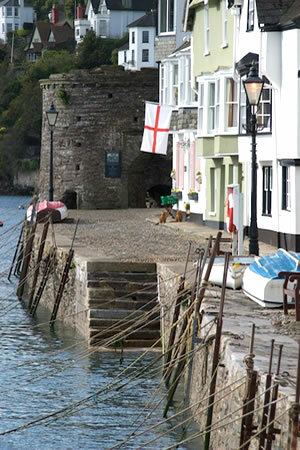 Whether you are after a family holiday, break with friends or a romantic weekend getaway, Dartmouth offers an appealing all year round destination enjoying spectacular views of the River Dart and out to sea.